What's an Example of a Word Problem That Has a System of Linear Equations with Infinite Solutions? Like riddles? A word problem is just like a riddle! In this word problem, you'll need to find the solution to a system of linear equations solve the riddle and find a location on a map. Check it out! 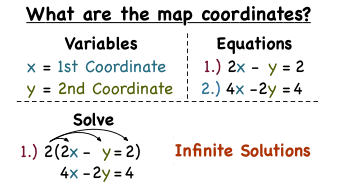 How Do You Use a System of Linear Equations to Find Coordinates on a Map?